Ogg Vorbis produces small, high quality audio files using non-patented technology. You can make Ogg Vorbis files to distribute or sell your music without any restrictions or fees. There are players for OGG files for almost all computers. Some audio players can play Ogg Vorbis files, but it is not widely supported as MP3 and M4A formats. To configure Ogg Vorbis Conversion Settings, click Formats >> Select Standard Formats >> OGG >> Configure. By default, the compressor that is selected is OGG-Vorbis. The frequency is set at 48000 Hz, bitrate at 160 Kbps and audio channel on Stereo. 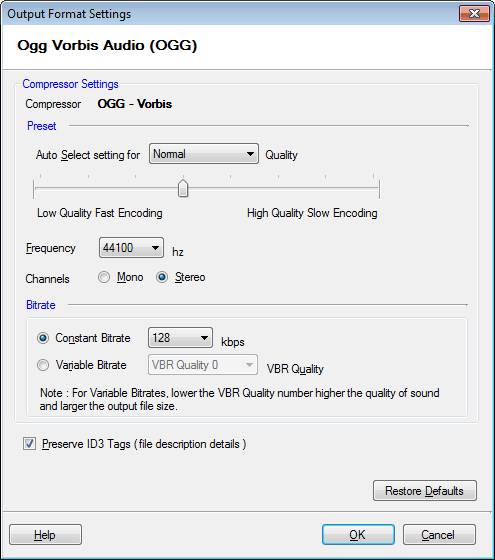 Some built-in Ogg Vorbis presets are designed to provide the best possible quality and file size. They have been tuned using rigorous listening tests. These presets are highly recommended over any custom set of parameters. The default setting is the Normal preset. To use a Preset, select it from the Auto Select settings for list, or drag the slider. Higher-quality encoding takes longer than lower-quality. Audio files can contain information like the name of the song, artist, album, etc. On enabling the option Preserve ID3 Tags, the information is read from the original file (if available) and is encoded into the new one. When you play the output file, your media player displays this information.